The first Sunday in November is Bonfire Night. It is also the day of the fifth Round of the Northern League. I've been promising myself that I would get my finger out and play in an ADLG competition this year. So I have begun my preparations. "I created these as a result of teaching ADLG to someone completely new to wargaming of any kind." This sparked something in me. The previous Sunday I had played FOGR and used my own reference sheets and they helped enormously. Anyway, I downloaded Alan's QRS to see if his would do the same. It didn't quite; good though it is. I wanted something more "process focused". 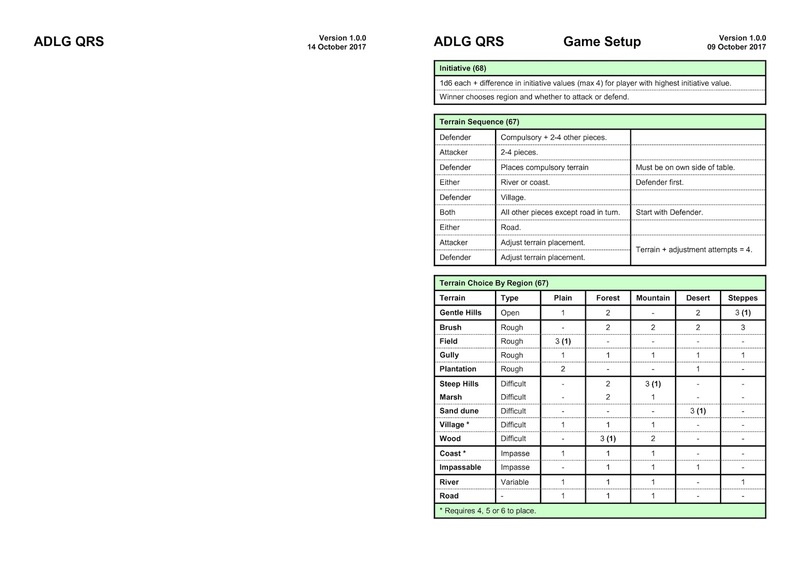 In Alan's QRS all the information is there but it's grouped and not separated by the different phases of the game. 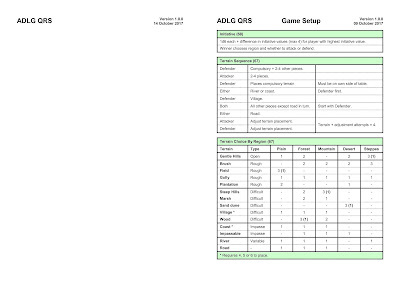 Nonetheless Alan's work did spur me on to read the rules and begin to create my own reference sheets. So thank you Alan for making me read the rules (many times). Present all the key tables for each phase with all the necessary definitions and exceptions. 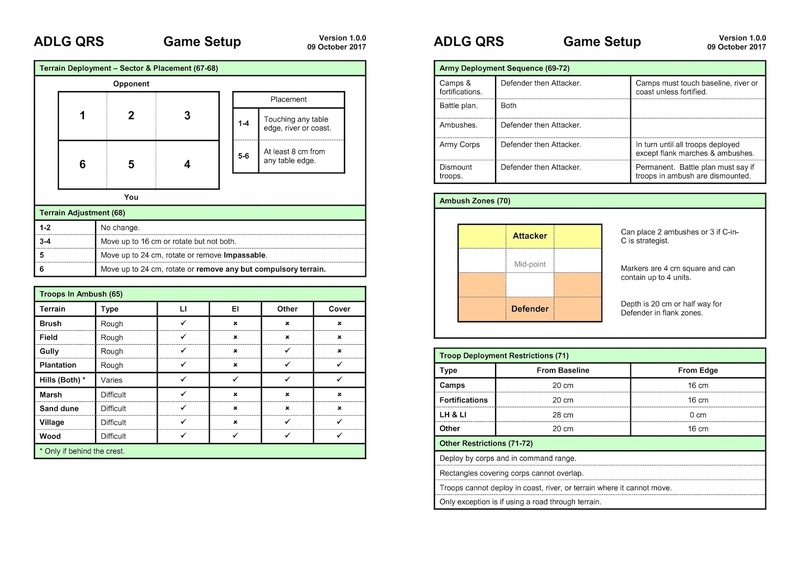 Outline the sequence of play for each phase especially set up & routing. Do all of this in a maximum of two sides of A4 per phase. You will see that I'm not aiming for a quick reference sheet as such but more a concise playing aid. The idea is to have a folder open showing two sides of A4 and, as the turn progresses, turn the page to show the details ready for the next phase. This page covers deployment dicing, terrain adjustment, ambush possibilities, troop deployment sequence, ambush zones and troop deployment restrictions: all on one page. The flow isn't perfectly linear but it's close. In use I would look at the first page to refresh my memory of the set-up sequence and then use the table at the bottom to choose my terrain. Then I would switch to the second page which has everything I need to deploy the terrain & my troops. 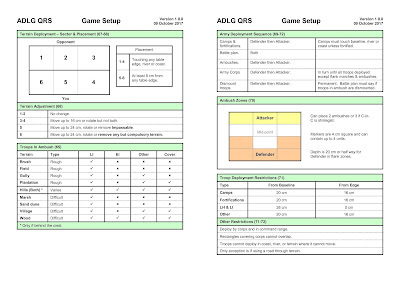 As the game moves on I will use the next sheet(s). You can download a pdf copy of my current working document here which includes the movement pages. On a technical note the pages are A5 to give me more control of the split column design. So if you want the A4 version print the pdf "two pages per side". If I get enough time I will prepare a sheet, or sheets, for shooting. I've already done my homework on this and I not sure I will enjoy this quite as much as the sheets presented here.